Heavyocity's Free Production Loops were built entirely from the critically-acclaimed virtual instrument, NOVO: Modern Strings. Delivering over 350 MB of all-new WAV & Apple Loops files (NOT contained in NOVO), Free Production Loops is a rare opportunity to sample the award-winning sound design quality of Heavyocity completely free of charge. Built entirely from NOVO's dynamic playback engine CYCLE, Free Production Loops offers 60 straight and triplet rhythmic loops, enabling users to experience NOVO's elite audio processing capabilities firsthand. Recorded at the famous Eastwood Scoring Stage at Warner Bros. Studios, NOVO is a world-class, deeply-sampled orchestral strings instrument...but that’s where its similarities to other orchestral VI’s end. Beyond the almost 40GB of fully customizable sound-designed string samples, NOVO enables composers to tweak, process, layer, and sequence like no virtual instrument ever has before. 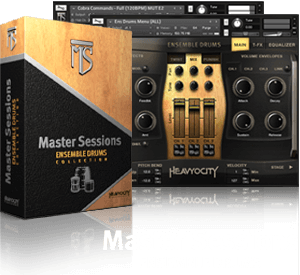 Imagine the possibility of fusing superior orchestral strings with Heavyocity’s signature sound design; it’s a new frontier in hybrid film, game, and television scoring. Simply put, there has never been a cinematic strings instrument quite like NOVO: Modern Strings, and in all likelihood, there probably never will be again. What truly gives NOVO: Modern Strings its power is the level of control and sound manipulation provided by the interface. Enter CYCLE, a brand new dynamic playback engine from Heavyocity. The product of years of in-house development, CYCLE boasts a set of controls that can quickly create rhythmic pulses, swells, stutters, and glitch effects, as well as effectual granular-style pads for ambient drones and textures. CYCLE can be used to add subtle motion to a sustained pad, or to completely transform a sound into glitchy mayhem. Long, evolving sequences can be crafted by chaining up to eight patterns together. The possibilities for sound design with CYCLE are virtually limitless; proceed with caution.